First Class Watches Newsroom | First Class Watches & James Moore Jewellers have got the X factor! First Class Watches & James Moore Jewellers have got the X factor! 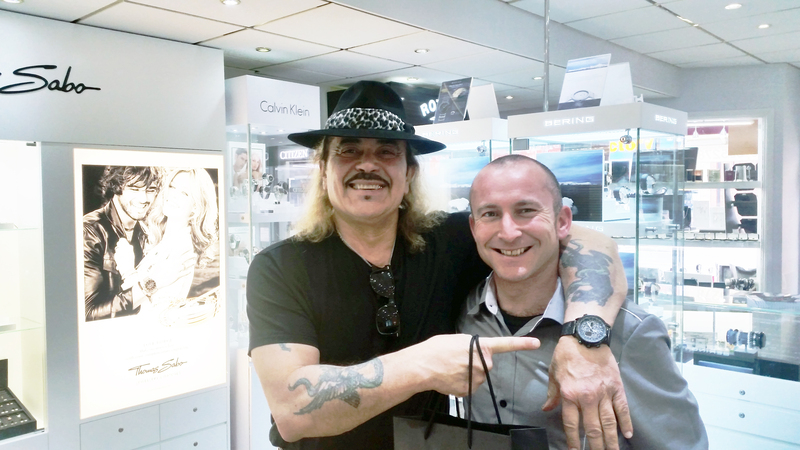 A First Class Watches customer service representative was met with a telephone enquiry from a charismatic and colourful gentleman last week who had some queries regarding the extensive range of watches available on the First Class Watches website. After a quick discussion of the customer’s needs the two homed in on a Citizen Black Ion-Plated watch from the Navihawk Radio Controlled collection. As the conversation drew to a close and names exchanged the member of staff could hardly believe it when he discovered that he had been talking to Brazilian-born singer, and X Factor finalist, Wagner Fiuza-Carrilho. As a personal fan of the singer the representative implored him to finalise his purchase in store to which Wagner agreed. And it doesn't seem like this will be the last time Wagner will be visiting Kenilworth as he’s already got his eye on another watch for his collection! Wagner shot to fame on UK television in the seventh series of the X Factor in 2010 after entering the contest hoping to make a “new start” and provide for his son. Wagner came 6th in the show and was one of the top 10 contestants asked to go on the X Factor tour 2011. Now a household name Wagner is using his new found fame to make guest appearances and personalised video messages through his public Facebook page where he has over 170,000 people following him. Launched in 2005 by high street jewellers James Moore & Co, First Class Watches is a family owned and operated business who have used the power of internet retail to reach customers from all corners of the globe. More than ten years on, they are one of the UK’s largest independent watch retailers with hundreds of thousands of happy customers. Using their responsive website customers can browse a stock of over 5000 watches and more than 85 designer watch brands at their leisure. First Class Watches uses self-photographed 360-degree imagery, product reviews, price matching and free watch adjustment to allow customers to make an informed and quick purchases while receiving the same service and warranty they would expect from a retail store. For more information please contact press@firstclasswatches.co.uk or visit www.firstclasswatches.co.uk.